Fry up enough of the vegetable pancakes known as oladyi to have both a tasty breakfast and a quick snack later. I think it’s no secret that Russians love pancakes. We have two main types: bliny, the yeast-based thick pancakes and blinchiki, the thin ones that are similar to crepes. My grandmother gets very upset when I mix up the names! 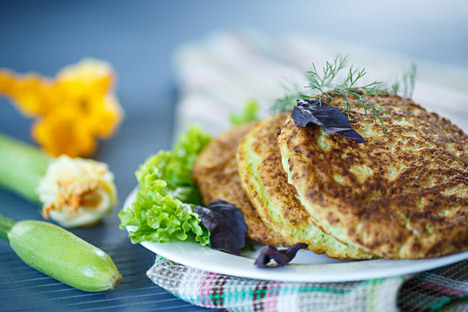 Russians also love oladyi, which are similar in concept to bliny, but taste very different – the dough is thicker and more dense, they usually are usually made with zucchini, squash or apples and baking soda is usually added to the mix make them fluffier. The closest thing in American cuisine would be a squash fritter. Oladyi make great breakfast food or a snack, they are nice served cold with sour cream or plain yogurt and are popular in summer – for the eaters, that is, not so much for the cook, who must stand over the hot stove cooking them! Sour cream or plain yogurt to serve. The beauty of oladyi is that they take very little time to prepare and you can play around with quantities and spices and extra ingredients you want to add – you just need to make sure that when you get ready to cook them, the batter has a thick, sour-cream-like consistency. I find zucchini a little plain on its own so I add chili, or even cinnamon to get more flavor. I think it would also go nicely with some cucumber-yogurt tsatziki sauce. Oladyi make me think of a long table outdoors at a dacha, a samovar and a great group of family and friends. Or a cozy breakfast at home. Whichever it is, I hope you enjoy them. 1. Beat eggs with salt. 2. Grate the zucchini, squeeze out the excess liquid, and add to the egg and salt mixture. 3. Add flour and baking soda, mix well. 4. Heat some oil in a skillet over high heat. Start frying the oladyi on high heat for about five minutes, then reduce the heat to medium, flip the oladyi over, and fry another five minutes.